Torquay is just about the start of the Great Ocean Road that follows the Southern Ocean west of Melbourne in Victoria. They call it Surf City because its the home of Ripcurl, one of the major surfing manufacturers in the world. There are heaps of surf shops here, its a bit full on, they should rename it to Babylon. But anyway, rant over, I had a look at the surf at Point Danger. The wind was off shore here and howling. The wind surfers and kite boarders were all out having fun in the wind, but the surf was tiny – less than a foot. On the beach were Silver Gull, Masked Lapwing, Pacific Gull and Crested Tern. Later in the afternoon I went to Taylors Park, in the center of town. Its not a bad park with lots of Sulphur-crested Cockatoos eating the tops off the eucalypt trees. They were doing the same at the Port of Echuca on the Murray River. A couple of Pacific Black Duck were on the pond, ravens and magpies were in abundance, and some Red Wattlebirds were making pests of themselves as usual. After that, I went to the Deep Creek Reserve, just down the road a bit. Its quite a large reserve and they have done a good job maintaining it. Congratulations to Surf City Council and Lions. That being said there were not many birds around. I only managed to spot some Grey Fantail, Common Starlings, Rainbow Lorikeet, Superb Fairy-wren and a few New Holland Honeyeater. Barwon Heads is west of Melbourne, just past Geelong, going towards the coast. The Barwon River runs into the ocean here, and you can get a few birds on the estuary. In the afternoon, I went for a wander along the sand flats at the estuary. I had seen a wader and went back to get my camera. 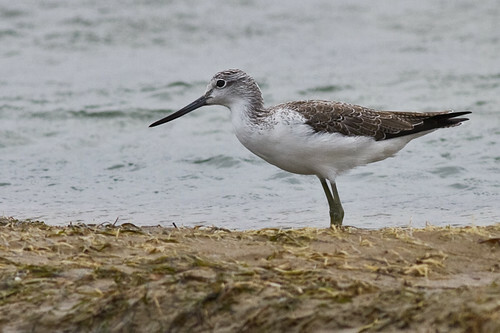 I thought it might have been a Terek Sandpiper but it wasn’t, it was just a plain old Common Greenshank. This one is a non-breeding bird, because of the grey streaks on the crown. 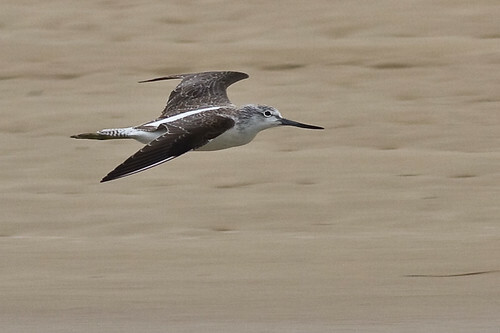 Here is a Common Greenshank in flight. Notice the white V shape on the back and the long legs that are trailing behind the tail. Luckily there were a few other birds as well. The ever-present Silver Gulls, Masked Lapwing, White-faced Heron, Australian White Ibis and a couple of random Little Pied Cormorant. A few bush birds made an appearance in the trees along the river – Superb Fairy-wren, magpies and a White-browed Scrubwren. When I was having my lunch I was visited by a rat who seemed to live beside the river in the grass. He came up to me as bold as can be and just walked straight past me. A young one crawled into a garbage bin further away. Later on I am going to do the river walk on the other side of the river. It follows the river a fair way, so hopefully I might see something or other. At least it will be a nice walk and I will get some exercise. So, see you then! Later that day, at 6pm I went upriver instead of going over the other side. 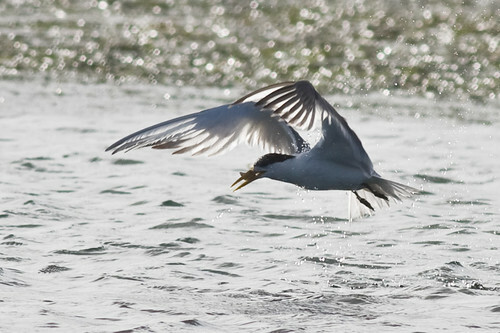 I saw some terns fishing so I went looking to get some shots of them. 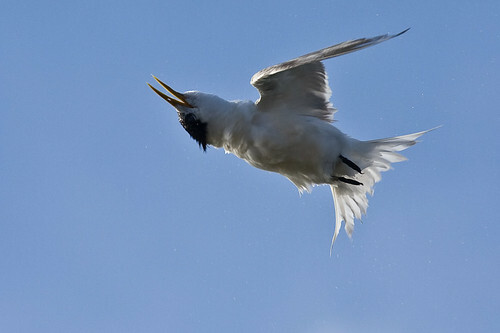 I did manage to get some shots and they turned out to be Crested Tern. 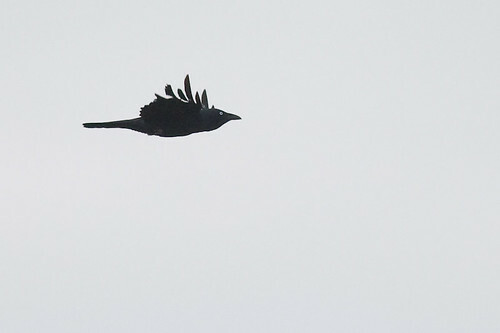 This one was doing some weird stuff, turning upside down whilst in flight. Or he turned his head upside down. I have no idea what he was trying to do. This Crested Tern managed to get a nice little fishie and got himself backlit against the setting sun. I think this photo works but I am not entirely sure. What do you reckon? I just kept walking a few more kilometers until I got to a fishing pontoon where it was the start of Lake Connewarre. I did manage to see some Pacific Gulls, pelicans, starlings and a Spotted Turtle Dove and not much else except lots of Silver Gulls. The lone Common Greenshank turned up again. The next morning I went over to the other side of the river on the Barwon Heads side and walked along the track up-river. A few hundred meters up the track, a sign proclaimed that it was now Lake Connewarre or Reedy Lake. There was very little along this track except ravens, Superb Fairy-wrens, a pair of Eastern Rosella and a bunch of Red Wattlebirds. Later on that morning after a coffee, I went up to the Bluff, hoping to see some pelagic birds. 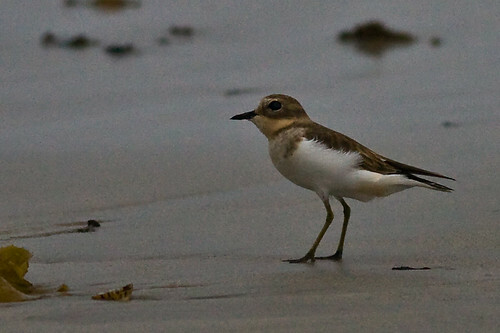 Instead I spotted some little waders down on the beach, so I went to investigate. 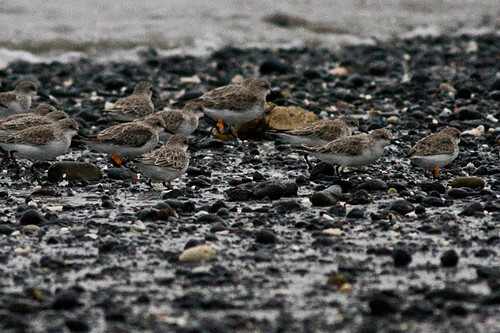 They turned out to be a mixed mob of Red-capped Plovers and Double-banded Plovers. 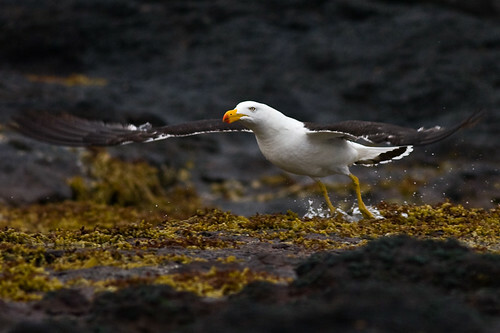 I thought I had seen a gannet but it turned out to be a Pacific Gull. The only other thing of note was a Nankeen Kestrel hovering over the cliff top. Warrangine Park stretches from Jack’s Beach to the end of Salmon Street in Halifax on the western side of Westernport Bay on the Mornington Peninsula. There is a track and boardwalk that goes for four kilometers. (Melway map 165 A7) Last night I started off at Jack’s Beach and walked half way just before sunset. The shame of it was that the swamp/marshes are dry because of the drought and no rain. There is absolutely no water in it and there were no waders or water birds whatsoever. It is probably not a good idea to come here in January or February, as these are the hottest and driest months of the year in southern Australia. I would most definitely come back about from October to early December and maybe from April to early June, before all the waders fly back to the northern hemisphere. The only waders or water birds that I saw were some Australian White Ibis and a Silver Gull. The first day all I saw was an Australian White Ibis, Superb Fairy-wren, Welcome Swallows and a Red Wattlebird. This one is a baby I think because it seems to still have the white gape around the bill. 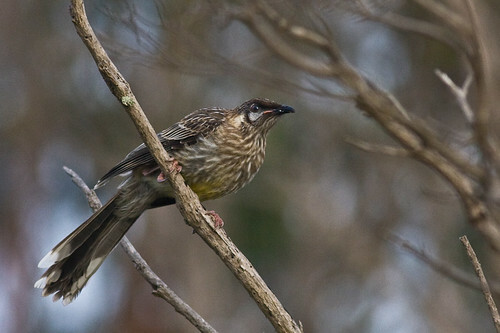 Juvenile Red Wattlebirds have a red-brown iris, smaller wattles and very white wing feather edges. 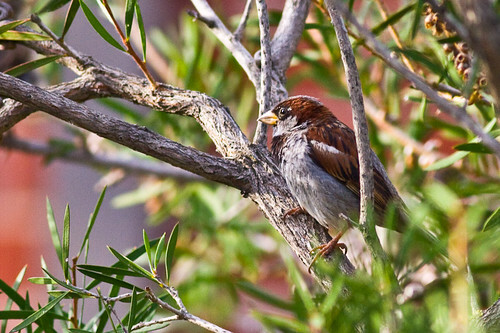 “Where to Find Birds around Frankston and the Mornington Peninsula” Ed. Larry Wakefield. Published by Bird Observers Club of Australia, Mornington Peninsula Branch. Balbirooroo Wetlands is just behind the school at Balnarring, on the western side of Westernport Bay in South-east Victoria. There was not much water around so it was lucky that there were a few bush birds around on the edges of the wetlands. First up, I saw a Red Wattlebird, Grey Fantail and a heap of Superb Fairy-wrens. A Little Pied Cormorant and a few Galahs flew over, and I just spotted a Black-fronted Dotterel on the dam of the adjoining property. On this dam were a variety of water birds such as Chestnut Teal, Black Swan, White-faced Heron, Eurasian Coot and Australian Shelduck. 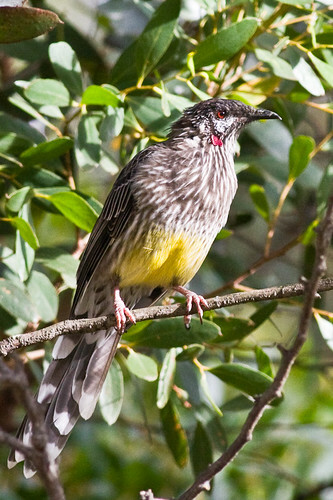 Back in the trees, I spotted a White-plumed Honeyeater, New Holland Honeyeater, European Goldfinch and this Little Wattlebird. Then I headed across to the Pun Pun Wetlands, which were epemeral wetlands. Not all wetlands are permanent. 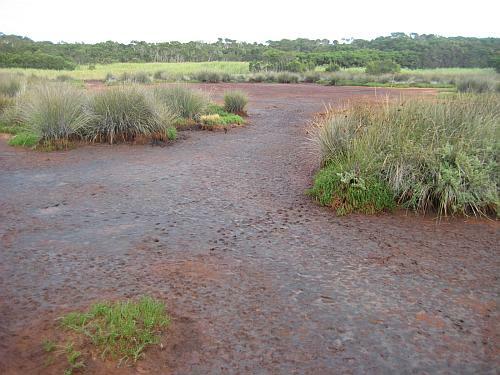 Many wetlands only contain water after heavy rain and may dry out after some time. I saw a Swamp Rat at the side of the road but he scurried into the grass before I had time to get a photograph of him. 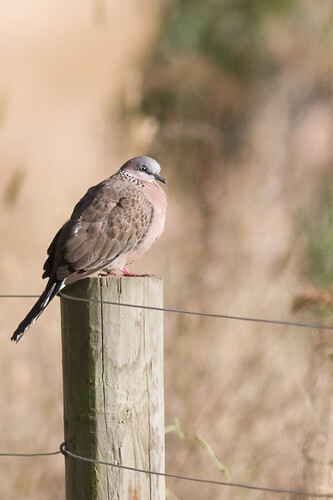 I did however manage to get a photograph of this Spotted Turtle-dove. The Coolart Wetlands is just around the corner from Balnarring at Somers. It is located 80 kilometers south east of Melbourne on the Mornington Peninsula on Lord Somers Road, Melways map reference 193 J9. There are a series of walking tracks throughout the park where you can explore the coastal woodlands, wetland areas, artificial lagoons and the formal gardens that surround the old homestead. 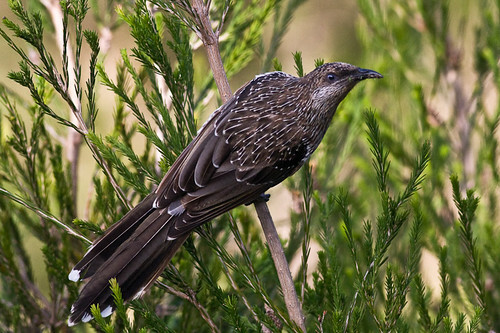 There was no water in the swamps but there were plenty of bush birds in the woodland areas. 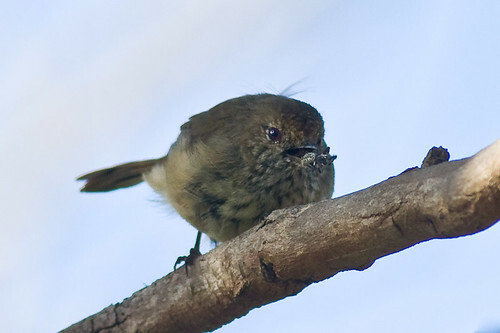 I spotted both Red and Little Wattlebirds and in one spot there were Superb Fairy-wrens, Yellow-faced Honeyeaters, Fantailed Cuckoo, and this Brown Thornbill chomping down on an insect. It may be a little grasshopper, it is hard to tell. There were also a number of Silvereye as well as quite a few Spotted Pardalote, who came quite near to me, allowing me to get this lovely shot of one. This one is a male because of the white spots on the top of the head. 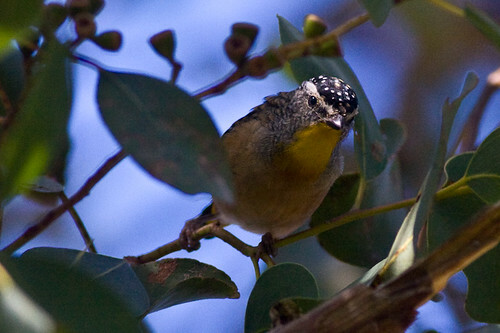 The female Spotted Pardalote has yellow spots on the top of the head. Greens Bush is a tract of land in Mornington Peninsula National Park. You can get to the Two Bays Walking Track along the road to Rosebud coming from Flinders township. The car park is about 7 kilometers from Flinders. Here is a link to a map This afternoon I went north along the track towards Long Point. The weather was overcast with intermittent rain squalls, so it was not very conducive to photography, but I charged along anyhow. The country is black sand covered mainly in Banksia trees with a few other shrubs and trees. A lot of Greens Bush is reclaimed grazing land and seemed to me to be in pretty poor condition. There were lots of kangaroos around and they had made lots of trails through the bush, causing lots of damage. I personally think that there are too many of them and are becoming a problem. The birds I encountered were the usual suspects for this kind of country – mainly Little Wattlebirds and Superb Fairy-wrens. The Little Wattlebirds dominated this area and were pretty aggressive, chasing off other birds who came into the banksia branches. 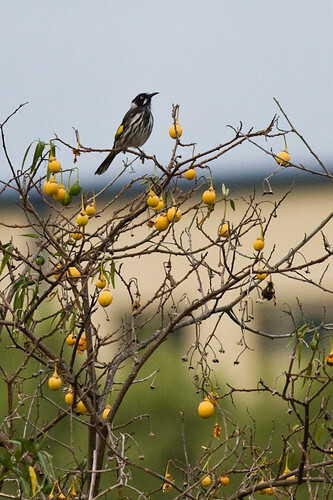 I assume that they chase off other honeyeaters who may be competition for their food. 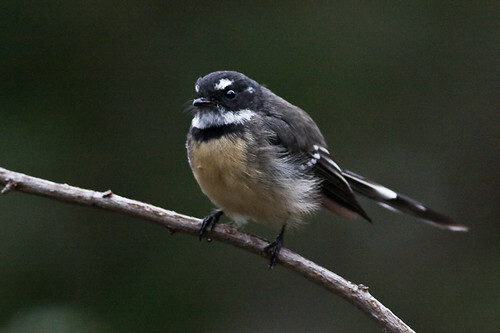 I did happen to spot a Grey Fantail, who had an unusually buff chest. I did also spot some Silvereyes and a mob of magpies. My best find was a blackberry bush that had some ripe blackberries on them, so I had a luscious feast of fresh berries. Yum yum. The only other bird of note was a flock of Crimson Rosellas. 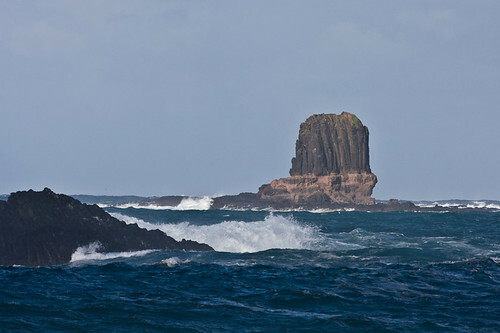 The next morning I went south along the Two Bays track towards Bushrangers Bay, which is about 2.5 kilometers away. It goes through more black sandy country with mainly banksias and coastal heath. When I got to the ocean, there were a big flock of Silver Gulls, about a dozen Pacific Gulls and a couple of Little Black Cormorant. On the way back I spotted a few Grey Fantails, Silvereyes and some magpies which I noticed were different to the ones in New South Wales. Their backs are more white and from reading the book, it seems that they are race tyrannica, so their actual scientific name would by Gymnorhina tibicen tyrannica. Flinders is a small town on the eastern end of the Mornington Peninsula, nearly a hundred kilometers south-east from Melbourne. I went over to the ocean side of the town and stopped at the Mushroom Reef Marine Reserve. There were quite a few birds on the beach, mainly gulls and Sooty Oystercatchers. Strangely, there were some Australian White Ibis who were foraging on the beach as well. I had not seen them do that before. There must have been more than a dozen Sooty Oystercatchers, so that is a good sign that they are breeding well. 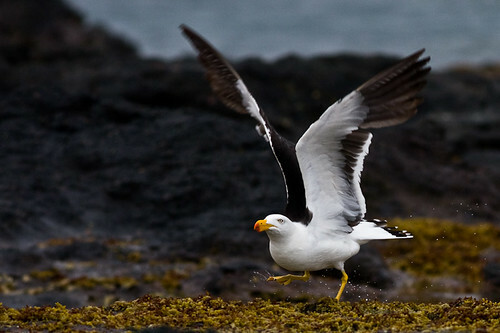 I also get to photograph some Pacific Gulls and I was very pleased about that because they are a tick for me. They seem to be in mainly the souther coastal regions of the Australian mainland. 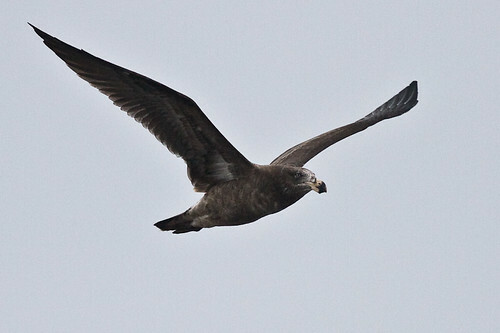 The immature Pacific Gulls are very dark and I was thinking they might be a different species when I first saw them. They only get their mature plumage after about 5-8 years. 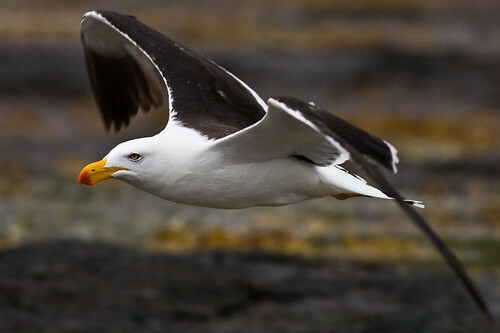 The adults have a huge yellow bill, with both mandibles tipped red. They are much larger than the Silver Gull and the wings are much darker as well, almost black. There was a Red-capped Plover running around all on his lonesome and a Double-banded Plover was also on his own. I am not so sure about the identifications for the Red-necked Stints and Double-banded Plover, so I will get back to you on those. Edit: Confirmed by Ricki. 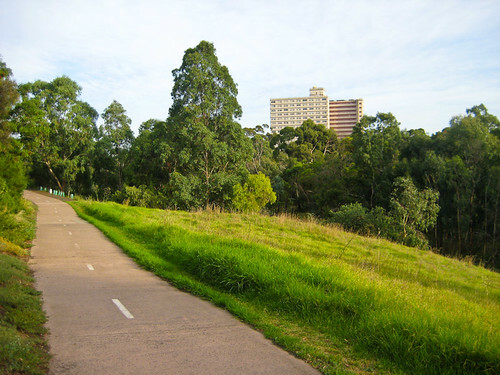 The Merri Trail is in the Suburb of Northcote in Melbourne. To get to it, go down High Street and turn into Westgarth Street, and then into Ross Street and follow it to the bottom. And there you will be. Merri Creek seems to be a creek that feeds the storm water drains into the Yarra River. Its quite amazing really that there is such a piece of bush in the middle of a huge city like Melbourne. There is a lot of bush regeneration going on and Melbourne Water is doing a great job in this regarding sponsoring the land care initiatives. 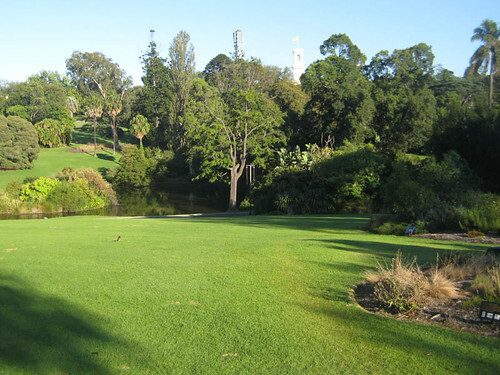 The Royal Botanic Gardens in Melbourne are quite near to the centre of the city. I got there by taking a train to Flinders Street, then catching a tram Numbers 3, 5, 8, 16, 64 or 67 up St Kilda Road and stopping at Domain Interchange(Stop 20). Then I walked up the hill to the Shrine of Remembrance, crossed the road towards the Observatory and walked through the gate. It is about two kilometres from the centre of Melbourne. The flamboyant and colourful cultivars and hybrids of the Perennial Collection are a highlight of February, so they say. First off, I saw a few Sulphur-crested Cockatoos flying past with their usual raucous cacophony. There were lots of Common Myna, Rainbow Lorikeets and Little Wattlebirds. 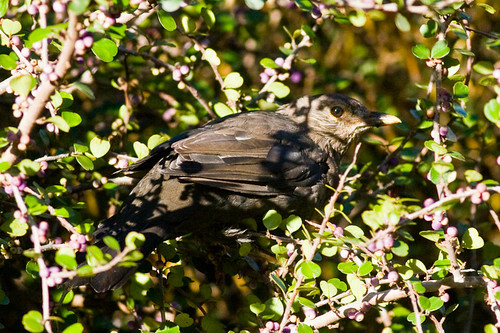 I saw this black bird near the herbarium, so I tracked him down and eventually got some photos of him. It was a Common Blackbird – but not so common for me, as I have only seen them a couple of times – at Mudgee, and here. 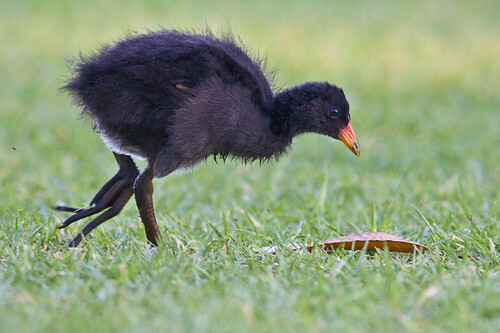 Around the ponds and lakes there were a number of water birds, mainly Purple Swamphen, Little Pied Cormorant, Pacific Black Duck, Darter, Silver Gull, Black Swan and these Dusky Moorhen chicks, who came really close to me. So close in fact that I could not focus my camera. They were well within my focal range, less than a meter away from me. I managed to spot a few other bush birds. Some White-browed Scrubwren were fossicking around amongst the bushes, the Brown Thornbills managed to evade a sharp photograph and a Willy Wagtail made an appearance over the other side of the lake. Its not a days birding without seeing a Willy Wagtail! The Royal Botanic Gardens are a great place for international birders who only have a very limited amount of time in Melbourne. They can zap out to the gardens and see quite a few different types of common Australian birds, and maybe even get a few ticks if they only have a couple of spare hours between conferences or commitments whilst doing business. This morning I took a walk along the Goulburn River near the football oval at Shepparton. It was quite dark this morning and I had great difficulties getting any shots because there just wasn’t enough light. First up, a flock of Straw-necked Ibis flew over head in V formation, no doubt headed to some paddock to root around for some grubs or insects. There were a bunch of Galahs and Australian Magpies on the footy field, pecking away for some tidbits. 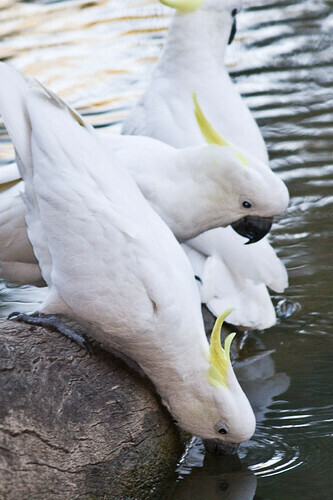 Down on the river bank, these Sulphur-crested Cockatoos were having a drink off a log over the river. 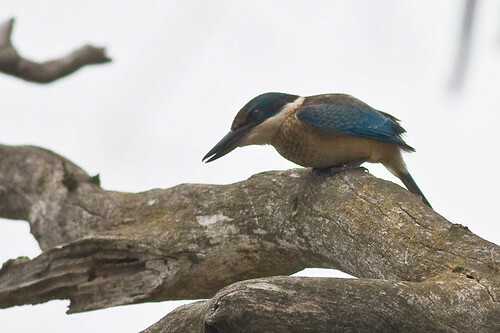 I spotted a couple of Azure Kingfishers on a log over the river as well. They were fishing and darting into the water but I could not see if they caught anything. It was so dark, I had the flash on them but they came out all blurry. 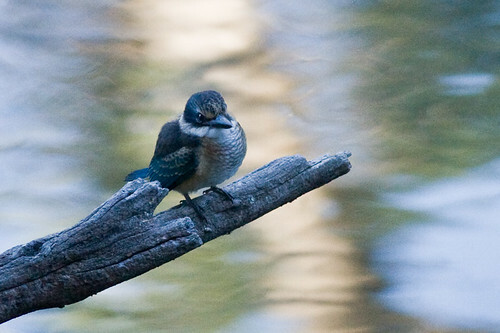 Azure Kingfishers have red feet, whilst sacred Kingfishers have greyish coloured feet. That is a good way to distinguish them, because sometimes the Sacred Kingfishers have a bit of a buff colouration on the chests or flanks. I kept on spotting some black birds on the banks of the river, but could not get a shot, as they were too flighty and I could hardly see them, let alone take a photo. I also spotted this very young Laughing Kookaburra. 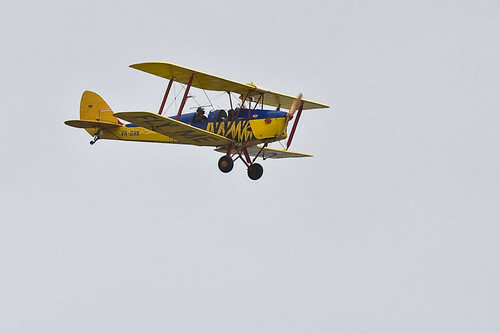 He must have just got his flying licence, I reckon. Reedy Swamp is out to the north of Shepparton in Central Victoria, Australia. It is just near the Billabong Garden Complex that is off the road to Tocumwal. I am guessing that it is a billabong that came off the Goulburn River. 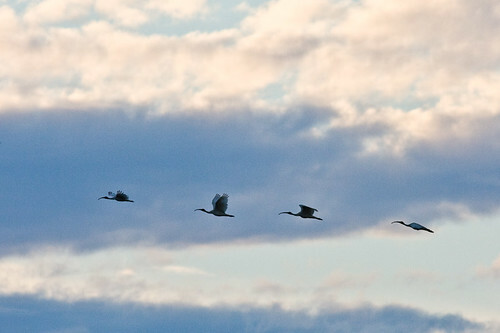 There were a few Water birds like Grey Teal, Pacific Black Ducks, White-faced Heron, Purple Swamphen, and these Australian White Ibis who flew across the clouds at sunset, making a nice photo opportunity. Mostly though, I had a look out for bush birds, and they were way more interesting. 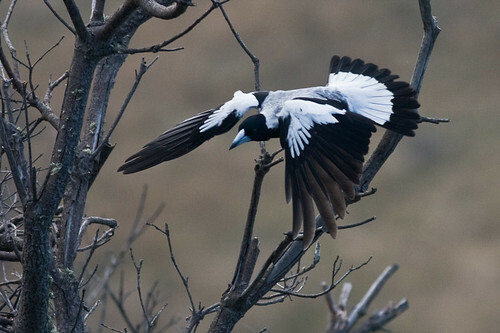 The Willy Wagtails, White-breasted Woodswallows, and White-plumed Honeyeaters were all having games of chasings. It was quite hilarious to see them all chasing each other in pairs around the trees. No hope at all of getting a photo of them, but. This Sacred Kingfisher had spied something on the ground and seconds after this, he dove down and grabbed it, but I could not see what he got. I hope he had a nice breakfast. 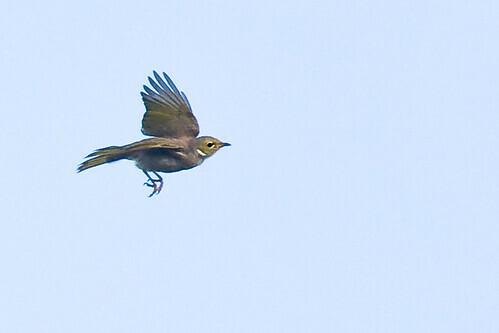 I also spotted a Blue-faced Honeyeater being harassed by a Noisy Miner. He was not too worried and mainly just shrugged him off. Noisy Miners seem to be very aggressive territorial birds. Later on, this mouse jumped up on this tree and just stared at me. I think its a mouse. Its wild life, because it is in the bush. ha ha. 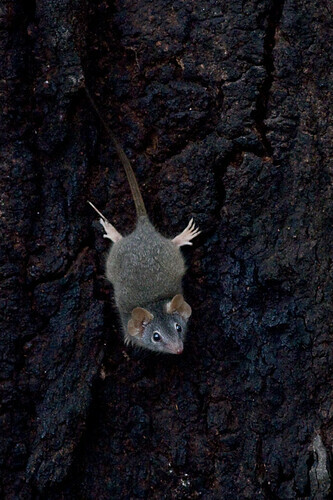 I think it might be a Yellow-footed Antechinus (Antechinus flavipes), a insect eating marsupial. Thanks to Pseudomogil for the heads up.